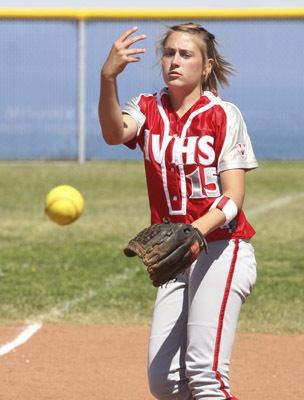 CRAIG L. MORAN/LAS VEGAS REVIEW-JOURNAL SportsÑArbor View HS pitcher Amanda Jones warms-up prior to their game against Centennial at Centennial High School Wednesday May 6, 2009. For three seasons, Arbor View’s softball team said and heard those four words so often, the players might have mistaken them for the school motto. Time after time, the Aggies came up just short of beating a team they had never beaten or qualifying for playoffs they’d only watched and read about. Led by a six-member senior class and a solid pitching trio, the Aggies are headed to the Sunset Region playoffs. Arbor View (16-14) opens play Tuesday at 4 p.m. at Majestic Park against Southwest League champion Durango (24-7). The Aggies finally climbed the mountain this season, helped by wins over Shadow Ridge, Centennial and Palo Verde in Northwest League play. The Aggies finished 8-6 and in fourth place in the league. This year’s team is almost identical personnel-wise to the team that was so close last year, going 6-8 in league play. But it’s a different makeup in terms of chemistry. View has allowed three or fewer runs in 19 of its 30 games this season, including the final five of the regular season. The Aggies have also hit well. Venable carries a .435 average and 27 RBIs into region play. Sophomore infielder Nichole Diaz is right behind at .424. In Tuesday’s other first-round matchups in the Sunset Region: Clark (18-11) meets Shadow Ridge (22-10) at 4 p.m.; Cimarron-Memorial (21-9) faces Bonanza (28-6) at 6 p.m.; and Desert Oasis (13-20) takes on Centennial (22-7) at 6 p.m. In Sunrise Region first-round games Tuesday at Majestic Park: Silverado (14-12) battles Valley (15-7) at 4 p.m.; Rancho (8-18) meets Green Valley (24-6) at 4 p.m.; Liberty (22-10) takes on Las Vegas (14-8) at 6 p.m.; and Eldorado (10-10) faces Foothill (24-11) at 6 p.m. Both regional title games are scheduled for Friday.